Through their online interface DogVacay DogVacay connects pet sitters with pet owners who need someone to care for their dogs while they're at work or traveling. As a DogVacay Host, you're in complete control of your own rates and schedule, with access to 24⁄7 support. To be a sitters you'll need to provide references describe your home or pet sitting facility and you must have experience caring for dogs. 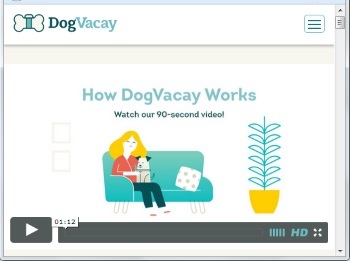 You'll receive video training, and you'll receive liability insurance through DogVacay, insurance coverage of up to $2 million is automatically included. You choose the dogs (breeds, sizes, ages) that you'll watch, set your own rates, and make your own schedule. Over 20,000 pet hosts have signed up in the U.S. and Canada. Some hosts earn six figures a year, the typical host earns $1,000 a month. In addition to at-home boarding, our Hosts can offer different pet care services, from pet sitting in the customer's home to daycare to walking and training, each service for which you set your own rate. With DogVacay, it's easy to build clientele, earn money, and have a great time doing it!